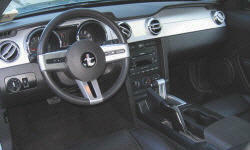 Ford Mustang Fuel Economy Pros and Cons | Page 1 of 1 | Why Not This Car? 19.6 MPG under tame driving (read: shifting at 2200rpms), 10.2 under agressive driving. V8, 412hp, 26mpg. Who thought those three things would ever go together. For a V8, I still get great fuel economy. I average 21mpg with combined city & highway, about 75% city. Only long highway trips, I average 27mpg at 70mph. V8 while not terrible, it does use more fuel than similar sized vehicles with smaller engines. The GT/CS is surprisingly economical; GT500 is a profligate gas gobbler - but who really cares? For a 4.6L V8 using 87 octane, 20 city and 28 hwy is not bad. Surprisingly, the V8 gets about 23-25 MPG highway driving IF you behave; better than my SUV. 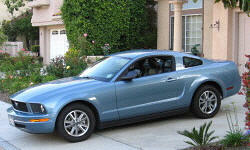 The Stang is my choice for my frequent 800+ miles trips once or twice per month. Not bad at all for a sports car with a big six cyl. If you drive it responsably, I easily get 22 mpg around town. At 65 mph I get 28 on the highway. I checked mileage carefully, hoping it was possible to get better than 18-20 m.p.g.- not likey in everyday driving. Premium fuel is expensive and mileage with a blown 5.4 is not stellar. I would not recommend this as a daily driver but it makes a hell of weekend and evening toy.